I used this weeks Farm Fresh Friday sketch from The Greeting Farm's blog. Wendy is from the set Never Ever by The Greeting Farm. She is colored with copics to match this gorgeous paper from K & Co...and then airbrushed inside the nestie frame. The flowers were misted with Glimmer Mist to give them some shimmer and then tied atop a silk ribbon bow. The circle elements in the corners are the Blossom die flower from spellbinders, cut then embossed with a Impressibilites screen over the die. I then inked the raised flowers with a cats eye pad...but its very faint and almost impossible to see in the photo. OK, I had to share these. What is every kids favorite day at school? 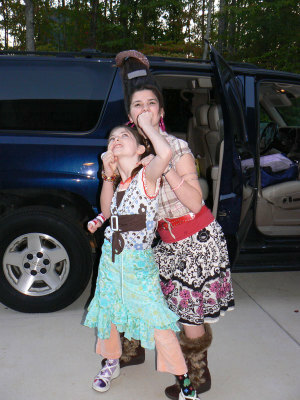 Why, Tacky Day of course! M<y girls were up an extra hour early this day fixing hair and such. Here's 2 shots...the goofy shot (we all have to do those in order to convince the kids to let you take ANY pictures) and the head shot. A friend emailed me this, and it is too funny! I had to listen to it 3 times to catch it all. 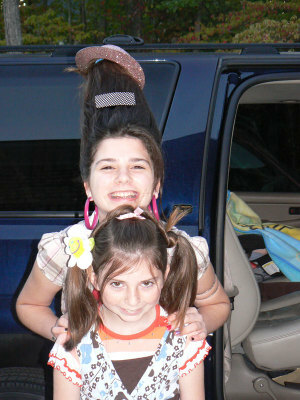 BTW, grab a kleenex, cause you'll laugh til you need it! I'm Back! (Sort of) & scroll down for a big GRIN! Well, I'm back from the land of the dead...but I'm still not 100%. I did have a day of stamping when I was almost better, but still not out and about. Now that I can drive & everything I'm back on taxi duty and way behind on the house! I was working on projects for my next stamp club. I'll share some more later, I need to tweek a few things, but here's one card for you. It started for Beate's weekend sketch, last weekend, LOL. But I love the way it turned out!! 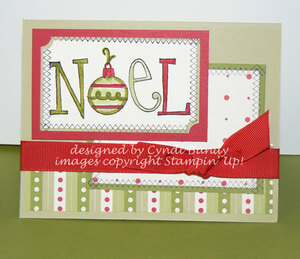 The main image is from "Big on Christmas", stamped in Basic Black on Very Vanilla and then colored with my Stampin' Write markers in Old Olive, Certainly Celery, and Real Red. I finally caved and bought "All in A Row". What on earth was I waiting for?? I love the look of the faux stitching! The argyle image was stamped in basic black after the layers were adrhered together. The background papers are both from "Dashing" DSP, and the cardstock is Real Red, Old Olive, and River Rock. Its tied off with a wide Red Grosgrain Ribbon. OK, so now its time for the big grin for everyone. Little Michael , my 4 year old. tripped over his flip-flop last Friday and apparently jammed his toe. He cried a bit, but then he was fine. He didn't want to walk on it for a couple of days, but you know how kids are, they cna milk anything! But the thing was, unless he bent his toe (which he could do) he was fine. If you made him bend it he whined. Finally we figured something may be up (even though he was playing outside just fine, LOL)...turns out he has a small fracture. 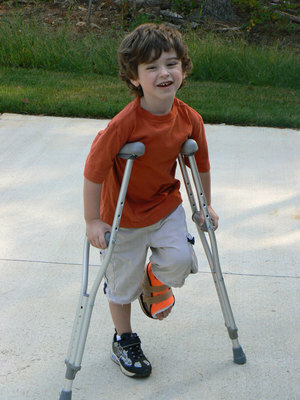 But what I have to share is the photo of him on the crutches, how cute is that?? He's been a show-stopper and head turner for sure this week! Thanks for stopping in, I'll get back the stamping mojo soon!